Fuel strainer ? Is that the filter attached to the fuel pump or the fuel filter outside the tank. Not sure but the outside fuel filter for a 99-00 civic was 11$ on amazon and it was an original K&N performance highflow one. So just going by that I feel these guys are extremely overpriced. 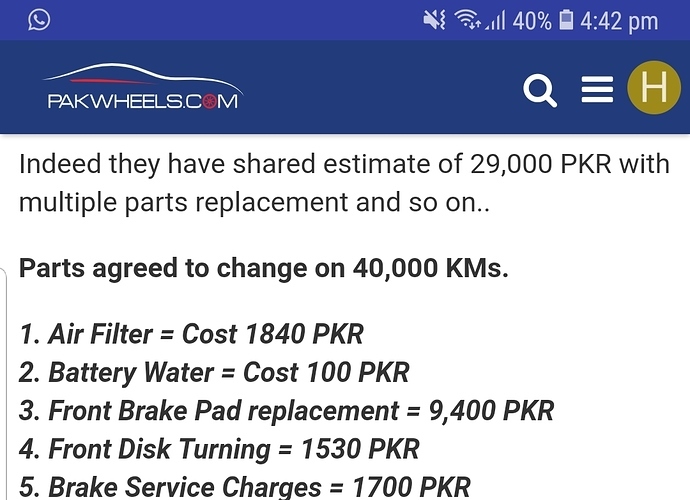 Labour for all that by a decent mechanic in Islamabad was would be no higher than 4k and even 4k is a lot higher than most would ask for. completely ripped, Japaneses brake pad costs under Rs. 2000 so no point in getting genuine as basically they are Japaneses with their own sticker on it. further, i dont know as what you refer by fuel strainer. These prices are much higher than what you would expect from market. Honda 3S dealership has this tendency to cash on their brand name without any quality in product or service. In my humble opinion, 3S dealership may only be approached for a car which is still under warranty. After that period, one should find parts from market and get the repair/maintenance from any good workshop dealing that brand. Honda Always asks for un necessary maintenance i mean change of fuel filter at 40 or 60 K thats not only absurd but stupid. I have driven my cars upto 150k and never ever needed to replace that fuel filter including a city once. They add a whole lot of unnecessary stuff like 100 kism k washer which are like 100-200 each . Firsr Brake Pads are changed at 40K Kms and than after every 25000kms. Secondly Genuine brake pads cost around 8000 to 9000Rs so at dealership they charge a bit more. Fuel Strainer is to be changed at 80K kms but that’s where they have looted you. Labour yes 3S labours are expensive while Brake Oil flush is good . All in All the only part which is extra is Fuel Strainer. You did the right thing i reckon. Getting the best work done with complete piece of mind ,What's the guilt over here? According to the user manual, brake pads should be replaced when they start giving a metallic screeching sound. After about 50k, Honda mechanics kept telling me every time I did brake service 'Sir bas 2k - 3k aur chalay gai ye'. They worked fine uptil 70k! What fuel do you use? Are you one of those guys who only go to specific pumps which are believed to give good quality fuel? Honda City's user manual states that fuel filter should be changed every 80k, BUT, if there is reason to believe that the fuel is contaminated, then the filter should be replaced every 40k. I got my fuel filter replaced on 40k because i go to all sorts of pumps and never have I used Hi-Octane. Now I've done 80k and I cant decide whether or not to get it changed this time as well. Yup i have 5-6 good fuel pumps in pindi and islamabad. i only go to those and normal petrol no hi octane ever used. How much is your car driven?